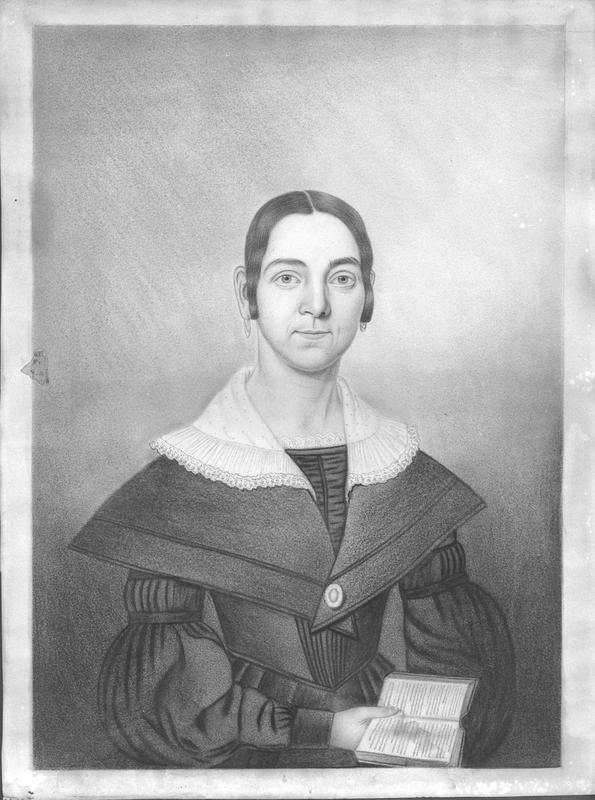 Olive Loring Portrait from the collections of the Worthington Historical Society (WHS) may be used for educational purposes as long as it is not altered in any way and proper credit is given: "Courtesy of the Worthington Historical Society, Worthington, OH." Prior written permission of the WHS is required for any other use of Olive Loring Portrait. Contact WHS at info@worthingtonhistory.org to request permission. Olive Loring Portrait is an art original, with genre portraits. Its dimensions are 15.75 in. x 11.69 in.. This is a pen and pencil portrait of Olive Loring, first Worthington milliner. Olive Loring documents stylish appearance in Worthington and models a hairstyle featuring bands of hair in front of ears " Victoria loops", very detailed costume includes lace edged tucker, collapsed leg of mutton sleeves pleated above the elbow, waist pointed in front. Loring also marks the change in lifestyle for Worthington from the pioneer weaving, spinning, dying, sewing to the arrival of a milliner and the means of local women to buy dressmaking services. It covers the topics art and businesswomen. The Worthington Historical Society identification code is 55-G-83. The Worthington Memory identification code is whs0173. This metadata record was human prepared by Worthington Libraries on February 6, 2002. It was last updated November 17, 2017. Whether wearing starched collars, handlebar mustaches or plaid, the people of Worthington have always been stylish. Lace up your boots for a stroll through a gallery of fashions from decades past. What better way to celebrate Women's History Month than by recognizing the remarkable achievements of the women of Worthington?